I’ve been setting myself mini challenges for each month of 2019. They’re a bit like New Year’s Resolutions but just for one month. In January, I challenged myself to not watch any TV for a whole month. That one was an epic fail but I learned a lot so it wasn’t a complete waste of time! In February, I challenged myself (and enforced the challenge on my family) to go for a whole month without using any single-use plastic. Before even beginning this challenge I knew it was unlikely I’d 100% succeed, so even though I technically ‘failed’ I really don’t feel like I failed at all because it has seriously opened my eyes to how much single-use plastic we use and waste. Not only that, but I’ve realised how easy it is to make little swaps to reduce the amount of plastic we consume. It was also nice to keep having the conversation with people about plastic and realise how many people are also doing their best to reduce the amount of plastic they use. I’ve got to admit that the whole plastic-free living did take over my life for about three weeks and, long term, I’m keen for this to be more practical. It pains me to say this but I’m not sure if it’s even possible to go 100% plastic free without drastically changing your life and altering your social habits. I want to make swaps I can realistically stick to rather than stressing and overspending to go for the plastic-free option. And I think this is a really, really important part of the challenge – it isn’t about being 100% perfect 100% of the time. When the zero-waste message is pushed onto people it can be scary and overwhelming and it means only a handful of people can actually do it. But if we all encourage everyone around us to do their best and try to make little swaps then it’s going to have a much bigger impact on the world if 80% of people do a little bit rather than 2% of people doing a lot! I was amazed at how difficult or expensive it is to make plastic-free swaps for some items. Things like toilet roll for example. I currently pay £0.31 per toilet roll when I buy a multipack of regular toilet roll that comes wrapped in plastic, but when you buy a multipack of Who Gives a Crap toilet roll (wrapped in paper, not plastic) it costs £0.83 per roll. OK, when I put it like that it doesn’t really sound like a big difference but it adds up when you’ve already got an expensive weekly shop. The same goes for milk. I pay £1.00 for 4 pints at the supermarket but it was about £0.80 for one pint when it was delivered by the milkman in a glass bottle. We get through 3 pints of milk a day so it’s a big difference. I don’t know what the answer is here but it really saddens me to think that zero-waste living is just for the privileged. I know I’m considered privileged but even I won’t be forking out an extra £1.65 per day for milk to come in a glass bottle. I know that doesn’t really sound like a lot but that’s over £600 a year. Milk from the milkman is too expensive but home made bread and soup with no plastic waste is something I can get on board with! Bread – Homemade in a bread maker! We bought a bread maker at Christmas time and we absolutely love it. Fresh bread every morning is the dream so this is a swap we were more than happy to make! Pros: The bread is SO good and the smell every morning is incredible. It’s also nice to know there aren’t any preservatives or too much sugar or salt in our bread. Cons: It takes less than 5 minutes to add the ingredients to the bread maker but there are some evenings when I’m really tired and can’t be bothered. I now do my best to buy all of our fruit and veg from the market. Price difference: It is more expensive but not a huge amount, maybe £5.00 a week more. I started going to a fancy organic farm shop but it was really pricey so I swapped to the regular fruit and veg market and it’s not too bad. I know there are online fruit and veg boxes you can buy but there aren’t many options in my area, they’re expensive and I usually know exactly what veg I want so I don’t want a random selection. One thing I have noticed is that ‘farmer’s markets’ are much more expensive than a regular fruit and veg shop. And while I’m getting our fruit and veg at the market it’s really easy to pop next door to the butchers for our meat. Buying meat from the butchers has been a game-changer for us because the meat is so much nicer. Because it’s more expensive I have cut back and we eat a lot more meat-free meals, but this definitely isn’t a bad thing. I couldn’t go back to cheap supermarket meat now either. I used to pay about £2.00 for a packet of diced beef at the supermarket and now I’ll pay about £8.00 at the butchers. It’s so much nicer but it makes me feel a bit icky at the thought of that cheap meat – what were they doing to make it THAT much cheaper? For many of my toiletries I’ve swapped to solid bars after a trial with Lather Box which I absolutely loved. I currently use solid soap, shampoo and body wash and I’m planning to try more solid skincare once I run out of my current products. These solid bars were a real eye-opener because they made me realise there is absolutely no point in buying things like liquid soap in plastic bottles. Solid soap is the same, it’s just as good and doesn’t add to our single-use plastic waste! Cons: The solid shampoo takes a bit of getting used to because it doesn’t leave your hair as soft or shiny but it does give it extra volume so there’s pros and cons there. I also tried solid conditioner but it made my hair a bit static. Sam and the boys didn’t bat an eyelid when it came to using solid shampoo and body wash so it was a really simple swap for the family. I don’t remember when liquid soap became a thing but a bar of soap is just as easy! I haven’t tried using other plastic-free skincare. I have problematic skin (sometimes really dry, sometimes really spotty) and I’ve just found a skincare routine that works for me so I’m a bit reluctant to change. Convenience food was a biggy for me, especially while I’m travelling. I’m sure there will always be times when I end up buying the odd pre-packaged salad but it’s something I’ve managed to cut out completely when I’m at home. It’s really just about being organised and either making myself a packed lunch and preparing meals from scratch. Something I generally try and do it make a massive evening meal so Sam and I have enough for leftovers for lunch the following day, so this cuts out the lunch time sandwich buys! I also work from home so I’ve got no excuse really! When I’m not at home I’m somewhere with the kids and I usually take a picnic because it’s so much easier. We’re kind of lucky but also unlucky that we don’t have many takeaway options in our area. There’s no Deliveroo and most of the delivery options are pretty rubbish so we never have takeaway. I did used to buy a lot of pre-packaged supermarket food, things like pre-chopped veg and prepared meat dishes, but I’ve got used to cooking from scratch. I use my slow cooker a lot and prepare a lot of salads so there’s always nice food in the fridge. No more takeaways – just look how much plastic there was for three people! As you’re probably aware, most children’s toys are 100% plastic. I’m not going to deprive the boys of toys so I’ve been buying anything for them second hand. There’s a great charity shop locally where I’ve found some bargains and the boys don’t mind. Making homemade pizza – cheaper, healthier and more fun! No more broccoli wrapped in plastic! My plastic-free month was an absolute eye-opener and if it’s something you’ve been thinking about then I highly recommend giving it a go. You might not stick to it 100% but that’s OK, it’s not about being perfect, it’s about encouraging everyone to make small changes that will have a huge impact. Surprisingly, giving up plastic did change our lifestyles for the better. I was looking back through the photos on my phone from February to include in this post and I realised that month was very slow, homey, outdoorsy and natural. We spent a lot of time outdoors, went for picnics, baked cakes, went for walks to walk of the cakes, cooked a lot, ate a lot, went for more walks to walk off the hearty stews and huge wedges of home made bread. Life was a lot slower and healthier and I liked it! A plastic-free challenge with children is tough in some ways but easy in others. Visiting farm shops and markets is a lot of fun for kids. They loved baking cakes and helping me to cook meals from scratch and taking picnics everywhere we went. But it was also hard because…well try telling a two year old he’s not allowed any grapes because it’s impossible to find them without a plastic container! I definitely recommend trying a plastic-free month, if only to highlight how much plastic you use and find simple ways to swap to non-plastic alternatives. This was really interesting to read! We’ve also found that it can cost quite a bit more to go plastic free which makes it really difficult but I’m confident that there are some changes we can make relatively easily, particularly when we already try to cook from scratch most of the time and always carry bottles with us. Make-up wipes and clingfilm are two of the things that I seem to use a lot of unnecessarily so they will have to go! And they are two things you can so easily swap for other things! We have a lot of tupperware in our house so we don’t really use clingfilm. I don’t use make-up wipes but we do use a lot of babywipes so I need to look into washable alternatives. I just don’t fancy the idea of washing pooey wipes! 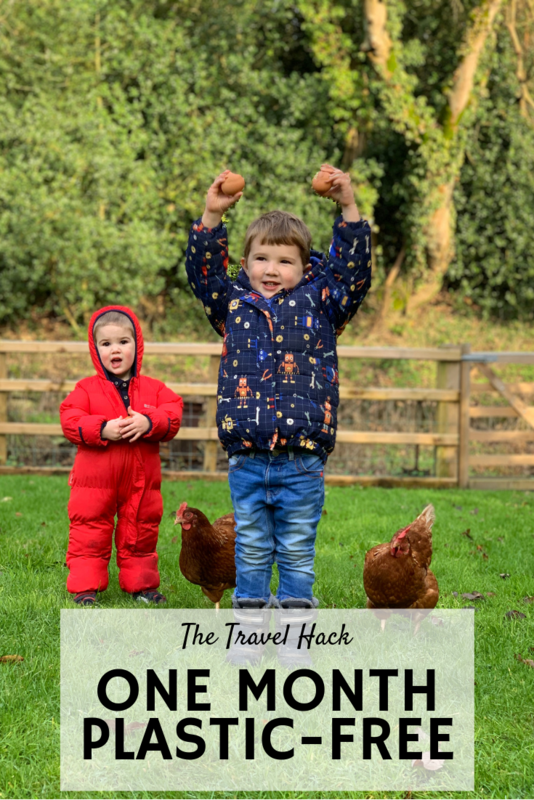 I always wonder how plastic free would work with kids and now I know, some great easy swaps Monica and I’ll definitely be trying them! Berries are the only things we really struggled with for the kids. You definitely need to be more organised about preparing snacks but I’m sure the homemade snacks are much healthier! This is so great and really interesting Monica!! Well done for doing such a great job! I’ve been dying to try the shampoo and conditioner bars from Lush so I think that might be my next swap. I’ve not heard great things about the bar conditioners though so we’ll have to see! Do they really!? I didn’t know that. I’ll have to check out my local Sainsburys!